When talking with her mom, strangers often compliment Mehlani’s big, beautiful eyes. What those people don’t know, however, is that Mehlani has Axenfeld-Rieger syndrome — a rare condition that affects the development of the eye. Martinez told BuzzFeed News that Mehlani was diagnosed when she was just a week old. “I had never heard of it until it happened to us,” said Martinez. Axenfeld-Rieger syndrome affects the cornea and iris, so the eyes have a different appearance than most other people’s. The iris, which is the colored part of the eye, can appear small or misshapen. Extra holes in the iris can occur that make it look like there’s more than one pupil, or the pupil may be off-center. About half of those with the syndrome also have glaucoma, which is internal pressure inside the eye that can damage the optic nerve if it’s not treated. It can make a child’s eyes appear larger than other children’s, and over time, it can eventually lead to impaired vision and blindness (although surgery can help prevent this). Mehlani’s has glaucoma, although so far her vision is fine. Martinez said they don’t yet know what’s in her future, but she has to wear sunglasses outside because glaucoma can also make your eyes sensitive to light. But the struggle isn’t just medical. Martinez has also had to navigate the comments she gets from total strangers. She recently shared those in a series of tweets that have since gone viral. “I’m always left with a weird feeling. I just pray she’ll always know how beautiful she is,” she wrote. She also worries how other kids will treat Mehlani once she’s old enough to start school. “At this point I think she’s just too young to understand, so she doesn’t know any different, she doesn’t know anything is really wrong with her eyes,” said Martinez. But for now, Martinez feels less alone. 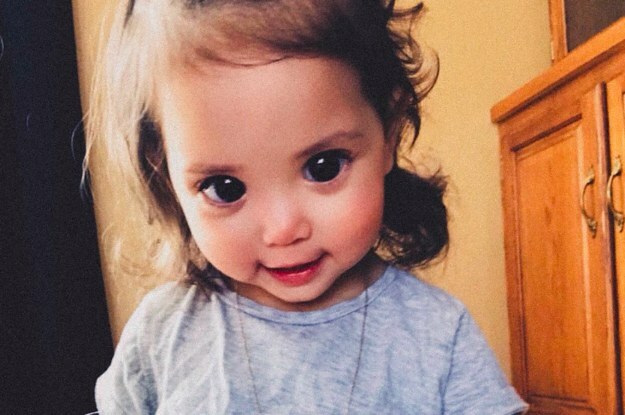 Since her tweets went viral, she’s been contacted by numerous parents who also have children with the same syndrome. “People are super nice and just letting me know if I had any questions I could ask them,” she said. Martinez wants Mehlani to know she’ll always be loved, even if strangers aren’t kind. “I’ll just remind her — I already do — how beautiful she is,” said Martinez.